Standing Stones: More Than Stonehenge! 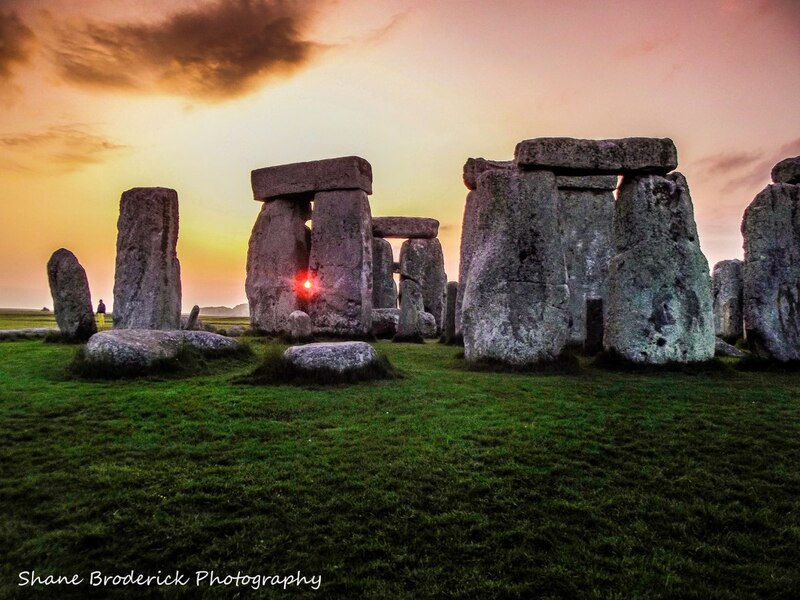 Stonehenge is the most famous stone circle in the world, and with good reason. Its size and structure make it a fascinating feat of engineering. But, there are many other stone circles, and other neolithic stone structures, to be found around the world. Despite all the public interest and archaeological research, we still do not know why these monuments were built. The best we can do is study them and speculate. Archaeologists, anthropologists, and in some cases mythologists, all take their own background knowledge into account when hypothesizing just what the ancient stone circles were used for. Most of the stone circles in Britain and Ireland are believed to be built between 3,000 - 2,000 BC near the end of the Neolithic Era. Although prehistoric people did not leave written records, they did leave clues that give us hints about their lives. We assume that they were spiritual people due to certain finds such as neolithic homes that include spaces not used for living purposes and appear to have ritual purpose. The burial of bones beneath home floors indicates a belief in the afterlife and probably a worship or reverence of ancestors. So it is fair to postulate that the large monuments likely had ritualistic purposes as well. Much has been written about Stonehenge and Avebury as places where processions took place. That stone circles and other neolithic monuments were built to align with solstices and equinoxes indicates that the builders were very much in tune with the natural world, the happenings in the sky, and the seasons. 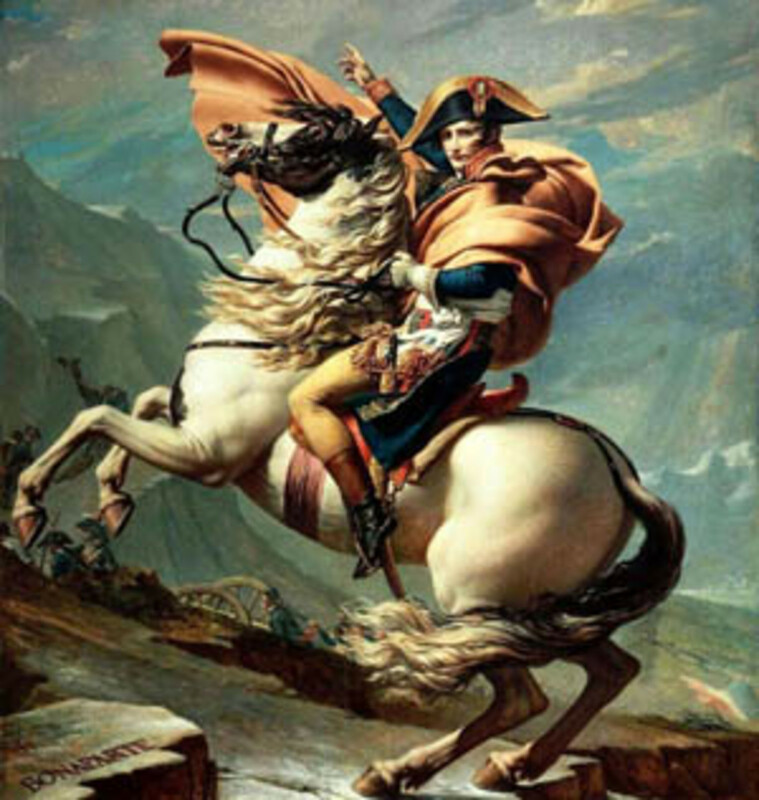 The so called Neolithic Revolution was actually a revolution in agriculture. Human beings moved from primarily hunter-gathers into farming communities. Therefore, paying close attention to seasonal changes would be crucial to the survival of the settlement. There are many other neolithic stone monuments and circles found around Britain and Ireland, so let's explore some of them. 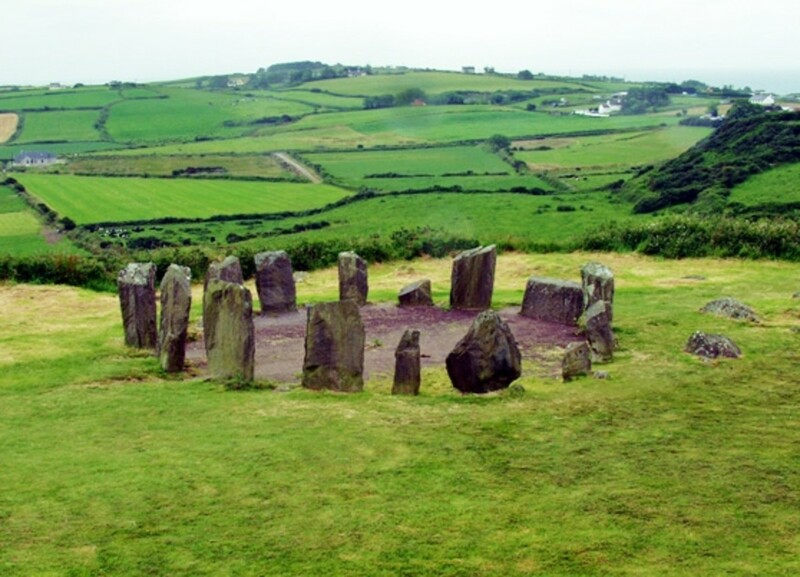 Drombeg stone circle, also called The Druid's Altar, is located in County Cork, Ireland. Its builders placed this ancient monument high upon a flat clearing on a rocky terrace that gives sweeping views of the countryside with the ocean in the distance. It is one of Ireland's best examples of a stone circle, and like other neolithic monuments it is associated with ancient ruins located nearby. The circle is comprised of seventeen standing stones. Excavations have revealed that there was once an urn burial site located in the center. And, there is thought to be a male and female association with two of the stones, with one of the larger pillar shaped stones representing the male, and the shorter round stone representing the female. As with other monuments, The Druid's Altar was built with the changing of the seasons in mind. On December 21st, the winter solstice, is when the setting of the sign aligns with the axis of the structure. Located nearby are Fulacht Fiadh, a communal cooking pit, and two neolithic huts. It is not known exactly what the cooking pit was used for, and several hypotheses have been suggested. Cremated bones have been found buried there (my sources do not say if they are human or animal bones). Tests have shown that up to seventy gallons of water could be boiled very quickly by placing red hot stones into the cauldron. It may have been a feasting site. 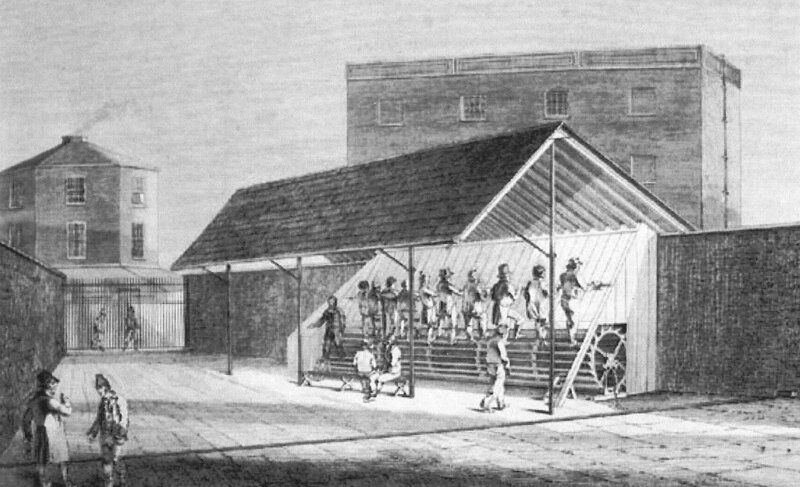 A large scale cloth dying operation has also been suggested. The Callanish Stones are located near the village of Callanish (in Gaelic, Calanais) on the west coast of Lewis in the Outer Hebrides of Scotland. This region was a hub of Neolithic activity, and over twenty ancient monuments can be found around the Callanish area. 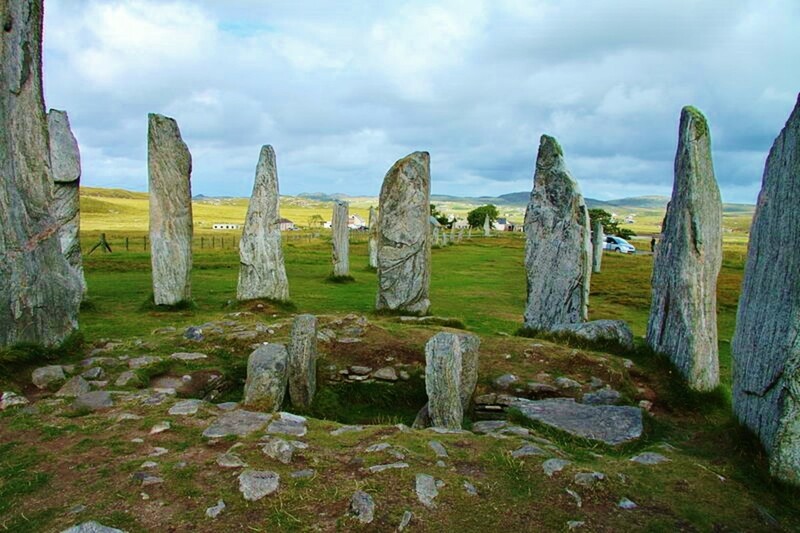 In fact, there is not one, but three stone circles in the Callanish region. They are known as Callanish I, Callanish II, and Callanish III. Featured here is the Callanish I circle. This is a very impressive circle. Although the stones may not be as massive or intricately constructed as those at Stonehenge, the Callanish Stones are nothing to balk at. The site contains over fifty individual stones situated in a complex arrangement. The tallest stone is placed at the center, measuring sixteen feet high and weighing over five tons. Surrounding the center stone are thirteen large stones, between eight and thirteen feet tall. More standing stones radiate outward from the main center circle in lines forming a cross, almost like rays of light from the sun. Two sets of lines leading northward seem to form a walkway where a procession was likely led to and from the circle. A burial chamber is found within the circle, and excavations indicate that the tomb was built a few generations after the circle was originally erected. 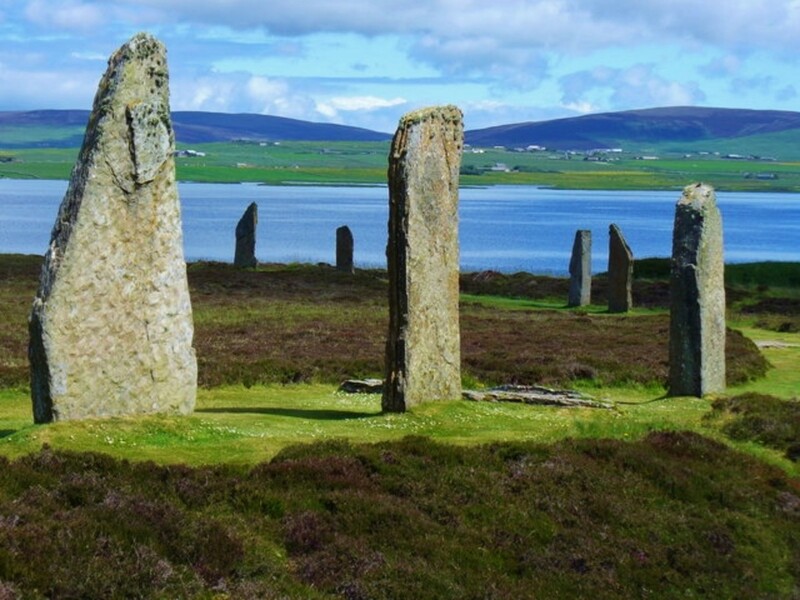 The islands of Orkney, Scotland are known for being home to the best preserved neolithic village in the world, they are also home to our next two stone circles. The Ring of Brodgar is part of a larger area collectively known as The Heart of Neolithic Orkney, which was granted World Heritage status under UNESCO in 1999. Also included are Maeshowe, a burial cairn, Skara Brae, a neolithic village, and The Stones of Stenness, another stone circle (see below). Although the stones at Brodgar are smaller than what are found at some other stone circles, it is an impressive monument none the less. The stones range from around two to over four meters in height. The Ring is the third largest stone circle in Britain, with a diameter of 344 feet. 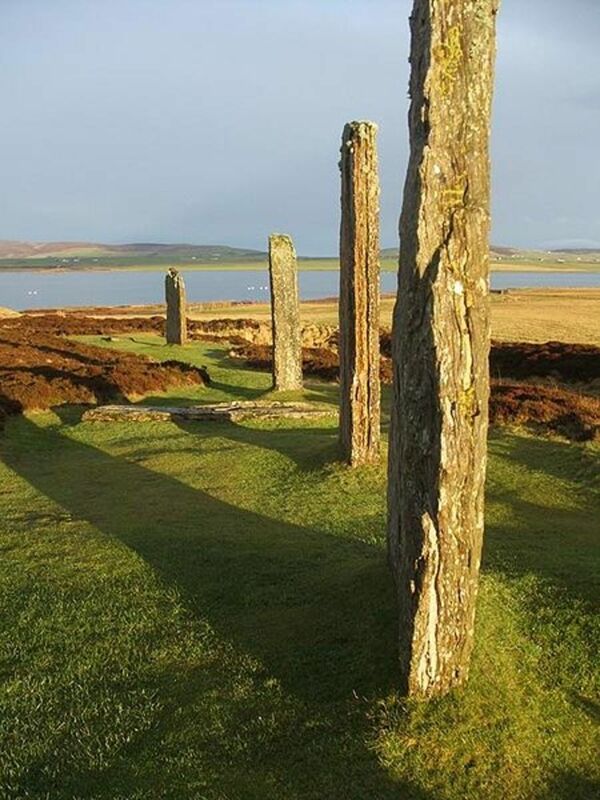 If you happen to be looking for information on Brodgar, especially when in Orkney, there may be some confusion as it is sometimes spelled differently. Orkney has many linguistic influences and at one time spoke a dialect of Old Norse due to Viking settlement. Later on, the islands were acquired by Scotland, so Scots became a common tongue. Now, of course, English is mainly spoken. But, even the English language has evolved greatly over the years. Changes in language are acclimated more slowly in isolated communities such as is found on islands or mountains, etc. So, in Orkney you may see Brogar. The common pronunciation by locals was "Broa-yer," but "Broad-gur" has been increasing in popularity. Read more about Orkney's Neolithic and Viking history here. 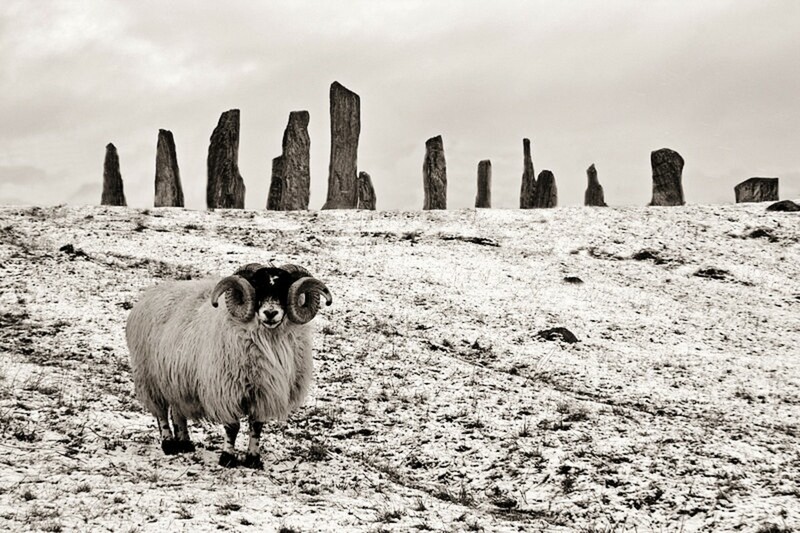 Sources for this section: Orkneyjar, Ancient Wisdom, and Historic Scotland. 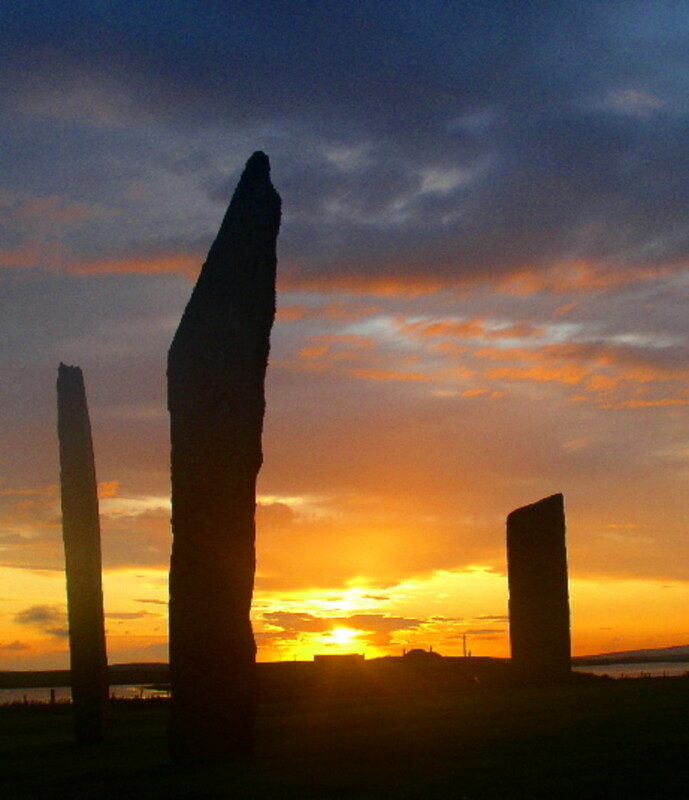 The Standing Stones of Stenness are another impressive henge of standing stones found in Orkney. 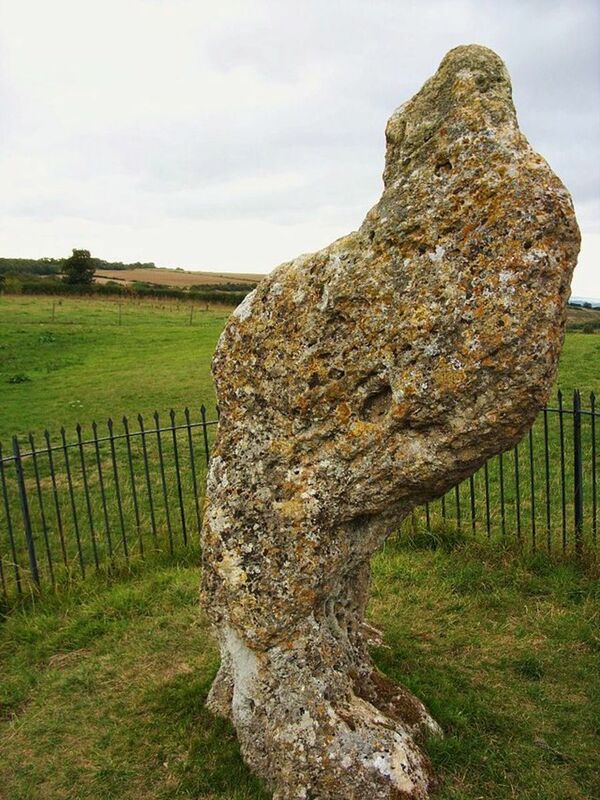 Although not many of the original stones remain today, the ones that still stand are massive, reaching upwards of six meters (nearly nineteen feet). While some stones are missing due to destruction, it also appears that the henge was never completed by the original builders. It is thought that nine to twelve stones were planned, but at least two were never erected. Of the original stones, only four remain. It was recorded in the 19th century that this site was referred to by locals as "The Temple of the Moon." This assertion has been questioned because there has not been much corroborating evidence to support the claim. However, we do know that the site held a mystical meaning for Orkney's inhabitants, and it was visited often by locals. Back in the 19th century, interest in archaeology and folklore was a burgeoning field. However, not everyone realized the importance of ancient sacred sites, and there are numerous examples of historical monuments being carelessly discarded. Unfortunately, this happened with the Stenness Stones. 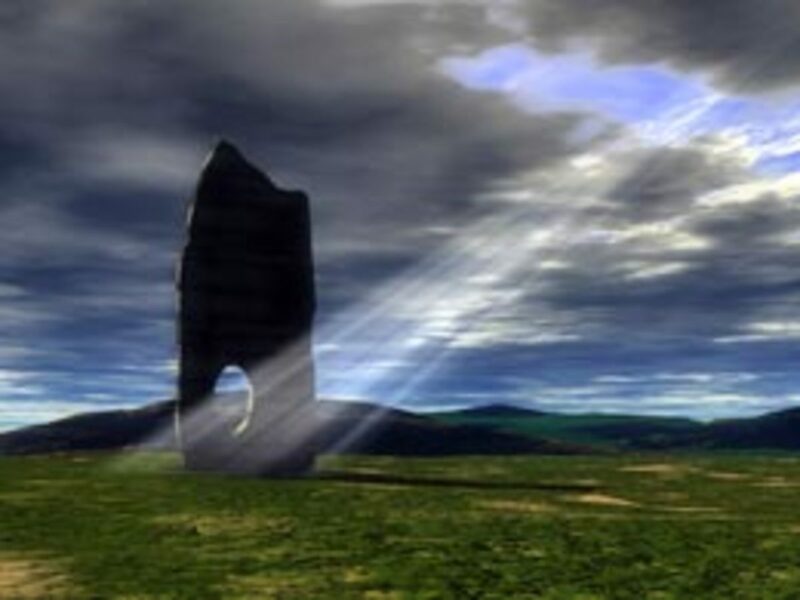 In 1814 the land upon which the Stenness Stones stand was leased to a farmer named Captain W. Mackay. Perhaps it was because he was not a native Orcadian, but a newcomer from the Scottish mainland, or perhaps his background in the military molded him into an especially hardheaded man, but whatever the reason, Captain Mackay had no love for these stones. Even though the site was not officially recognized by any government or international body, its fame had spread by word of mouth. People began to visit from far and wide, and tramped across Captain Mackay's farmland in the process. Not only did outside visitors make pilgrimages to this henge, but the local people of Orkney also paid homage there regularly. So, the grumpy old farmer took matters into his own hands and began dismantling the site, beginning with the so called Odin Stone. The Odin Stone was one of the main features of the Stenness site. It was a massive monolith that stood apart from the main circle. Its defining feature was a large hole that ran clear through the stone. 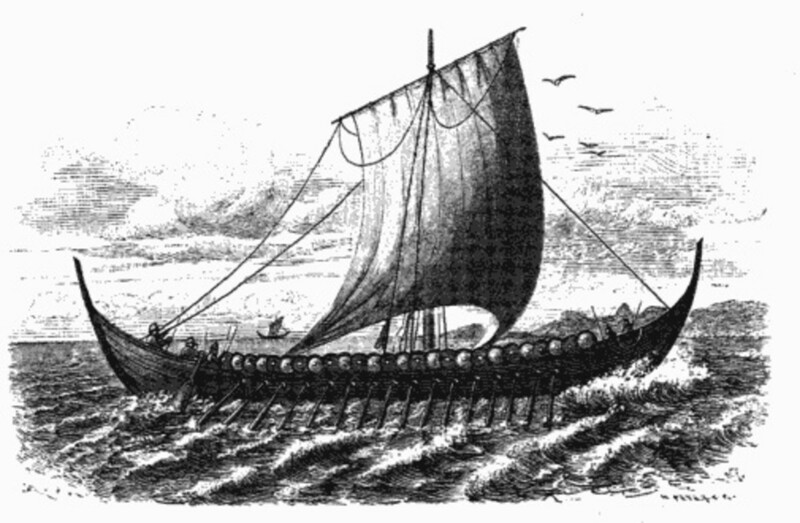 Although the original neolithic builders would not have been Odin worshipers, the later Vikings who settled Orkney were. And it was their descendants who would populate Orkney, speaking their Norse tongue for the next 700 years. Odin is known as the one-eyed god. So the single hole in the stone is likely the reason for its name. At least two stones were dismantled by Mackay, and one completely destroyed. Local legend has it that a piece of the Odin Stone survived for over 100 years. It was used as an anchor weight in a local mill for a time. When technology finally rolled around and the mill no longer used horse power, the stone ended up lying in a field on a local farm. Well, in 1940, that farmer's son, the story goes, had no idea about the stone's association. As it was too heavy to be moved, the young man smashed it to bits to clear the space for plowing. It is said that his father knew the history of the stone and was enraged when he discovered his son's actions. As for Mackay, the locals of Orkney did not sit idly by and watch this newcomer destroy their beloved monument. Locals attempted to burn down his house not once but twice! Finally he was served with legal papers ordering him to desist his demolition of the Stenness Stones. 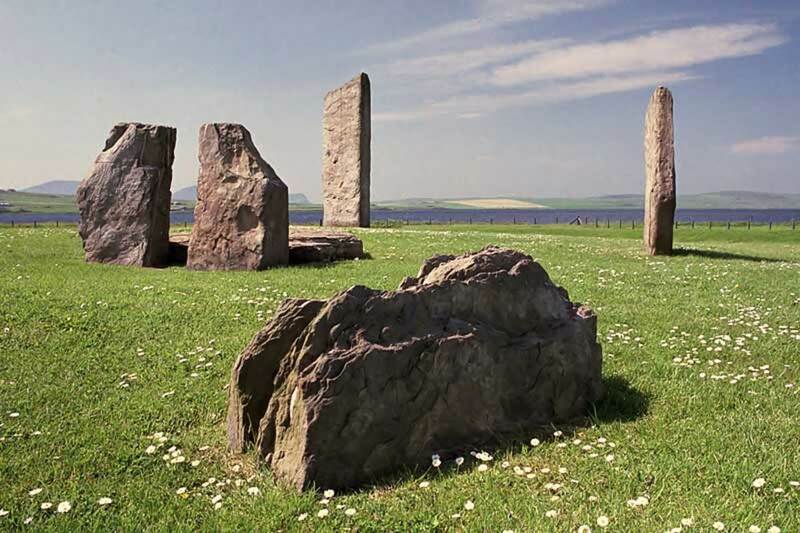 Despite the missing stones, the site at Stenness is important because it may in fact be the oldest stone circle in Britain, dating back to 5,400 years ago. 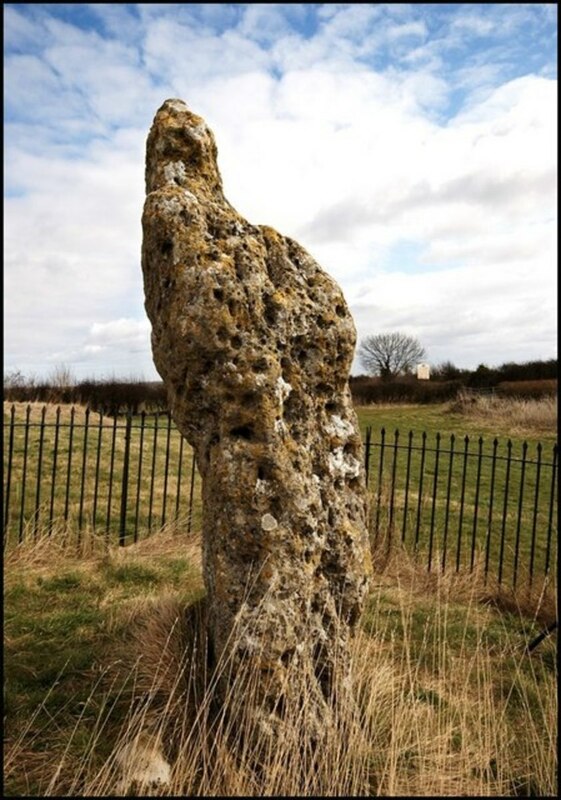 The Rollright Stones are found in England on the border of Oxfordshire and Warwickshire. 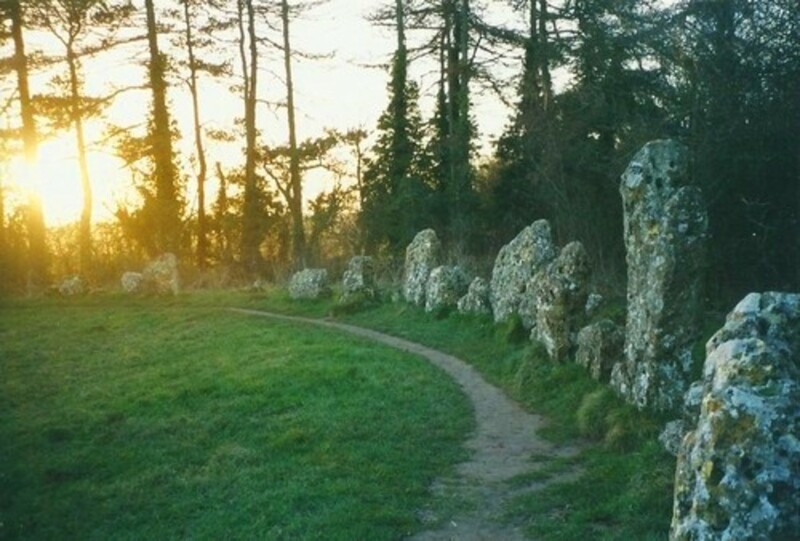 Just as the other circles mentioned are connected to other monuments, the Rollright Stones are actually three sites close by which together make up the complex. The name is thought to be derived from Hrolla-landriht, which is Old English for Hrolla's Land. The three monuments are called the King's Men, the King Stone and the Whispering Knights. As with Odin's Stone above, these names were added thousands of years after the construction of the monuments. But, also like Odin's Stone, the naming of this piece of land by a Germanic (probably Anglo-Saxon) settler is yet another indicator of the heavy presences of Germanic peoples in Britain. It is possible that Hrolla revered these stones just as his VIking cousins honored the Odin Stone. In fact, an alternate early theory for the name was that these stones commemorated a victorious battle by the Viking leader Rollo. 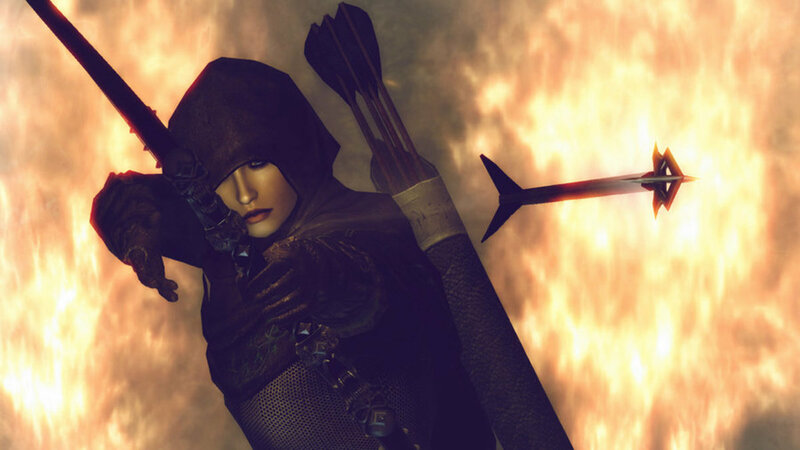 This story was common in the 14th century, but it is now known to be simply a fanciful legend probably thought up by the similarity of the names. While the complex itself is thousands of years old, and the name Rollright appears to descend from the Anglo-Saxon era, the names of the individual monuments are thought to date to the Early Modern Period (roughly the 16th or 17th century) and found their origins in regional folklore of the surrounding area. 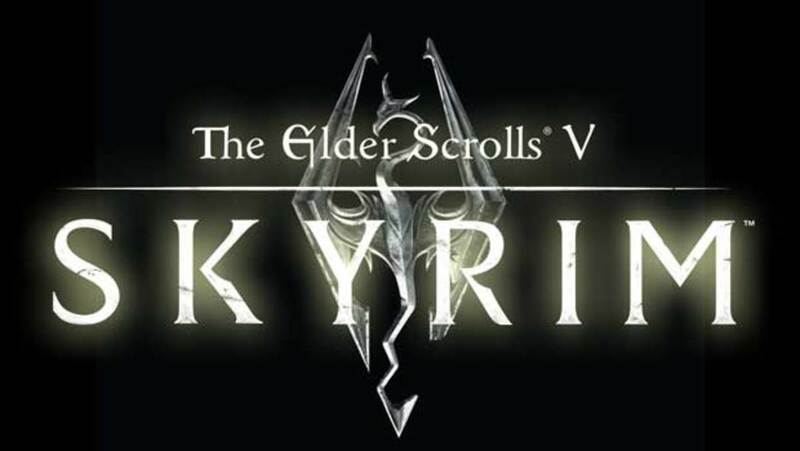 Three individual monuments are: The King's Stone, The Whispering Knights, and The Kings Men. Indeed, these names sound straight out of Mother Goose rhymes, many of which date close to the same era. The folk legend says that the stones were once a king and his court turned to stone by a witch! The King's Stone is a singular monolith that stands apart from the other two monuments. Many theories abound about its placement and purpose, but there is no agreement among scholars. It does not seem to have any astrological alignments, and there is no evidence that it was part of a processional way. Its significance is simply a mystery. Due to its unique shape, some have assumed that the stone eroded due to natural causes and weathering. This may be partially true, but sadly much of its decay is because of vandalism. Just as with the story of the Odin Stone above, some people simply did not understand the age and archaeological significance of this site. They did, however, understand the mystical and magical presence of the place. So some local passersby chipped pieces of the stone away to carry with them as good luck charms, leaving it in the awkward shape its in today. 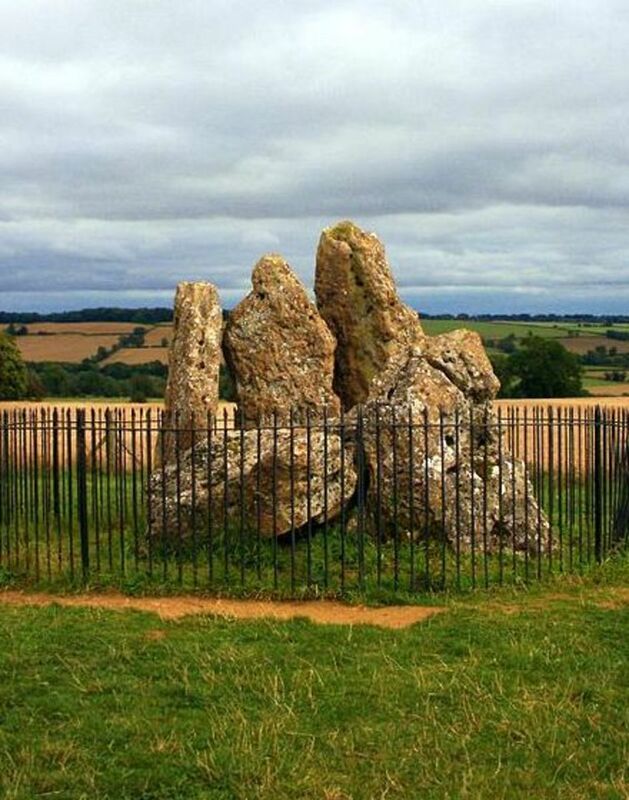 This monument is thus named because of the way the stones are positioned standing upright, close together, and leaning into one another as if sharing great secrets from a lost age. It is the oldest of the three monuments, making a burial chamber which is thought to have once been part of a long barrow. 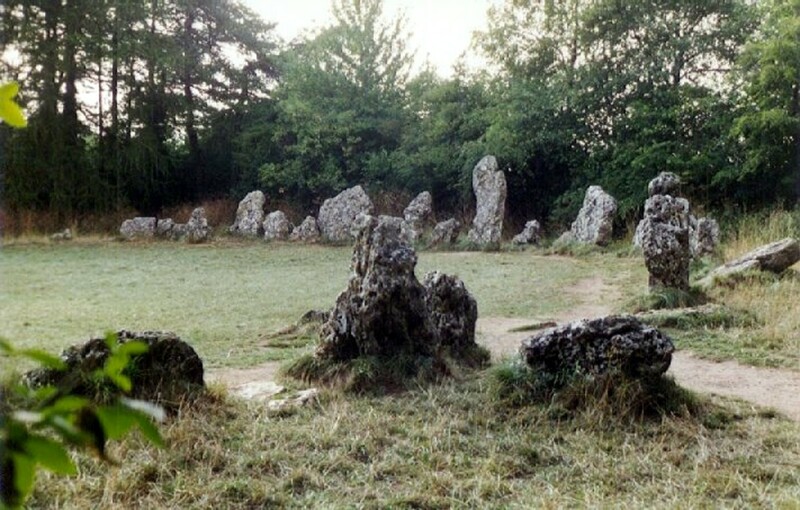 The King's Men is the stone circle at the Rollright complex. It was erected either late in the Neolithic Period or possibly very early in the Bronze Age. 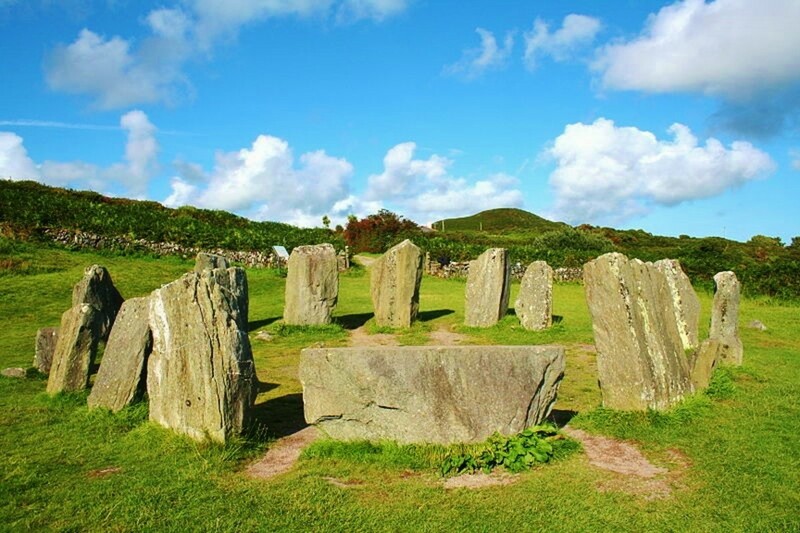 Although these stones don't seem as imposing as some of the monoliths found at other stone circles, the circle itself is constructed of an impressive seventy-seven stones. It is thought to originally have held over 100 stones. At one point so many stones had been removed or knocked over that the circle held only twenty-five. In 1882 a local proprietor took it upon himself to replace, or just stand up, the missing and toppled stones. This stone circle may be related to circles found further north in Cumbria; Swinside and Long Meg and her Daughters. The size and shape of the circles, as well as how closely the stones are placed together, indicate a similar building plan. Which of these stone circles was your favorite? While ancient monuments are found all the world round, circles such as these are found primarily in Europe, with the British Isles being a major hot spot. Although we can only begin to scratch the surface at understanding their original uses, we have seen that neolithic monuments often remained special places for the generations that followed. If you enjoyed this article, please like my writer's page on Facebook to be updated when new articles come out. I tend to focus on the history, mythology, and folklore of northwestern Europe. More articles can be found on my website. Love stuff like this, it just goes to show we still don't know what they were for, but they have great stories associated to them. This article was not aiming to cover every stone circle in the history of stone circles. It was about 5 of them. So it did not neglect anything. If there were only 6 stone circles in the world, then you would be correct. When a certain amount of knowledge is accumulated, creativity goes to work. We have found pyramids throughout Dgypt, the Sudan, Yemen, and South America. This can be true of for "Stonehenge" like structures. I would not equate them with Druids because they stand in a circle during religious ceremonies nor would I equate them with astronomy. I would simply say that we do not know though various theories exist. Thank you for the introduction to ancient stones beyond Stone Henge. They are all so incredible and whilst we know so much, it is frustrating not to know exactly why they are there. This was a real fascinating hub to learn about those stones in England. I love the photos too. It was an interesting read. Voted up! What a great look at a piece of history. Very interesting and thanks for the hard work. Very interesting and very well written, Carolyn! I hope there's more coming. Maybe I should just pop on over to your page and take a peek. Callanish is a wonderful site but the four lines of stones dissecting the circle are not original. They were added by the Victorians. Hi. ArtDiva, thanks for reading and taking the time to comment! I haven't had the opportunity to see the stones myself, but I hope to someday! I think the hole in the Odin Stone was natural, not man made, which is why it was considered so special. So many years ago, traveled through Ireland, some stones visited. The Odin Stone, in particular, is truly unbelievable, if the photo accurately portrays the monolith. With a hole running through it? How was that even possible back then? The countryside is one of the most beautiful, to return again, someday. There's still so much to learn about these stone structures, it's an interesting collection. Thanks for sharing this. The Rollrights are one of my favourite sites. It's tricky to find, but once you're there the intimacy of the place is striking. Great article! Upvoted and shared. Very interesting n informative hub .. I've never had the pleasure of seeing Ireland and northern England but these would certainly be on my to do list! .. voted up! There is also one in tuxcedo NY, in Sterling Forest park, above the renesance fair grounds. How I enjoyed reading about these hedges--and how I wish I could visit them and more! Hi carolyn, I live in England and never realised that there were so many of these stones! I have been to Stonehenge a number of times, but pathetically, I add...lol! I have never seen the others! this is totally fascinating, and bookmarked for when I go off on my travels again, great hub! Really interesting. Wish I had known about these interesting sites when I visited England. Worth a return trip! Thanks for the great hub. The circle (sphere, cone, and cylinder, etc) is a very important geometric shape. Whoa. I never knew some of these circles existed! Very cool. It really made me curious to know why stonehenge were made.The photographs are lovely! I'm so happy people are enjoying this! Thanks so much everyone! Wonderfully interesting hub Carolyn. I had no idea that there were so many different stone circles or henges in Britain. Why is Stonehenge the only one that we ever hear about? Great photos too. This is an excellent hub about a fascinating topic, Carolyn! I love all the descriptions, information and photos. I didn't realize that there were so many stone circles in Britain. I'll share this hub. Amazing hub - so fascinating! I must admit I had never heard of these sites, but I've always wanted to go to Stonehenge. After reading this hub and seeing the beautiful photos, clearly some of these other Stone Circles should be on my travel list too! Thanks for broadening my travel horizons! Voted up and pinned!! I've been lucky enough to visit the ones in Co. Cork Ireland. This was a terrific hub. I had no idea how many circles there were! Voted up and more and sharing!